Diabetes mellitus is a chronic metabolic disease with acute and chronic complications. Neuropathy is Microvascular complication, which leads to distressing neurological complaints and ultimately diabetic foot which may require amputation. Thorough clinical examination and investigations are required. Tight blood glucose control is sheet anchor of prevention and management. The clinical features of diabetes mellitus have been recognized over a thousand years ago. Both Type1 and Type 2 diabetes are associated with micro and macro vascular complications [1-4]. Microvascular complications include retinopathy, nephropathy and neuropathy. Diabetic neuropathy (DN) by causing an insensitive neuropathic foot causes considerable morbidity [5-6]. The first description of diabetic neuropathy was by Rollo in 1798 when he described pain and paraesthesias in the legs of a diabetic patient. Pavy described “pain of a burning and unremitting nature” in 1887. Diabetic neuropathy (DN) is a non-inflammatory disease process associated with diabetes mellitus and characterized by sensory and/or motor disturbances in the peripheral nervous system [7-8]. The presence of symptoms and/or signs of peripheral nerve dysfunction in people with diabetes after the exclusion of other causes. Diabetic neuropathy is a demonstrable disorder that can affect both peripheral and autonomic nervous systems. Neuropathy is the most common chronic complication of DM affecting up to 50% of patients with type1 and Type 2diabetes [8-11]. But the time of presentation differs. In Type1 Diabetes becomes symptomatic after several years of diagnosis; in contrast, Type 2 diabetes patients may have neuropathy at the time of diagnosis [12-14]. • Multiple lesions "mononeuritis multiplex"
Recent studies in patients with debilitated glucose resilience give critical bits of knowledge into the part of the level of glucose dysmetabolism in the improvement of neuropathy. The deleterious effect of hyperglycemia is affirmed by the occurrence of neuropathy connected with impaired glucose resilience [17-21]. In this setting, the neuropathy is milder than it is in recently analyzed diabetes, and small nerve-fiber involvement is the soonest noticeable indication of the neuropathy. Factors leading to the development of diabetic neuropathy [22-24]. Important biochemical mechanisms are polyol pathway, advanced glycation and oxidative stress. The pathogenesis of DN is multifactorial. The various pathogenic factors are inter related and together contribute to the development and progression of the syndrome [25-30]. The actual process of neuropathic progression is dynamic, with nerve degeneration and regeneration occurring spontaneously and simultaneously . The net balance between these processes determines whether the neuropathy progresses, regresses or stabilizes. The Sorbitol pathway appears to be involved in diabetic complications, particularly in microvascular harm to the retina, kidney, and nerves . 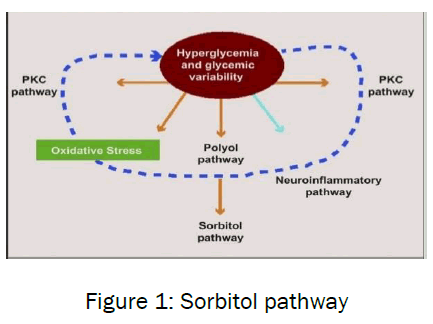 Sorbitol pathway can't cross cell membranes, and, when it gathers, it creates osmotic stresses on cells by drawing water into the insulin-free tissues [33-39]. Diabetic neuropathy influences every fringe nerve including pain fibers, motor neurons and the autonomic nervous system. It consequently can influence all organs and systems, as all are innervated. There are a few distinct disorders based upon the organ systems and individuals influenced, however these are in no way, shape or form select [40-46]. A patient can have sensorimotor and autonomic neuropathy or some other combination. Signs and side effects change contingent upon the nerve(s) influenced and may incorporate indications other than those recorded. Side effects typically grow slowly over years [47-51]. This stage is without pathology but with biochemical alteration in nerve function. It is reversible. This stage involves the loss of structural change in nerve fibers. It may be reversible. There is critical decrease in nerve fiber density and neuronal death in this stage. It is irreversible [54-57]. • There is a wide range of symptoms associated with diabetic neuropathy, and they depend on which nerves and parts of the body are affected and also on the type of neuropathy present. • Some patients have mild symptoms, while others are severely disabled. • In severe diabetic neuropathy loss of sensation can lead to injuries that are unnoticed, progressing to infections, ulceration and possibly amputation. Acute sensory neuropathy which tends to follow periods of poor metabolic control e.g. sudden change in glycemic control leading to painful neuritis . Patients may report that they cannot tolerate the sensation of sheets or clothing touching their feet. The acute, often focal onset suggests an immune-mediated or vascular process at the level of the posterior root or dorsal root ganglion . • It is predominant sensory neuropathy rather than motor. Earliest manifestations are loss of pain and temperature sensation due to small fiber affliction. Most patients with distal symmetric polyneuropathy will develop diabetic foot problems, like neuropathic ulceration, neuropathic edema and Charcott’s arthropathy. These may ultimately lead to refractory infections, gangrene and sepsis with loss of foot [60-62]. • The onset may be acute or gradual. Usually men above 50 years with poor glycemic control are affected. The cardinal feature is wasting of the thigh with or without pain. On examination there is readily demonstrable weakness of the iliopsoas, obturator and adductor magnus with relative preservation of power in the gluteus maximus and the hamstrings [64-65]. It has been previously demonstrated that pre-diabetes can also be connected with neuropathy. Based on the recent ADA rules, diabetes can be analyzed on the consequences of HgbA1c, fasting plasma glucose or 2-hour postprandial glucose levels. This announcement suggested the utilization of the A1c test to analyze diabetes, with an threshold of ≥6.5%. The established glucose criteria for the diagnosis of diabetes (fasting plasma glucose ≥7 mmol/l or 2-hour postprandial glucose ≥11.1 mmol/l) remained valid as well [9,66-69]. Quantitative sensory testing (QST) assess patient’s ability to detect a number of sensory stimuli and offer the advantage of determining the degree of sensory loss . Electrocardiography may reveal prolongation of the QT interval. This is secondary to imbalance between right and left heart sympathetic innervation . Eaton et al suggested that the endoneural edema reflected magnetic resonance imaging of peripheral nerves may initiate the deterioration that is later detected in Electro physiologic testing and neurologic examination . In diabetic patients the risk of DPN and autonomic neuropathy can be reduced with improved blood glucose control, and the improvement of lipid and blood pressure indexes and the avoidance of cigarette smoking and excess alcohol consumption are already recommended for the prevention of other complications of diabetes . In diabetic patients the risk of DPN and autonomic neuropathy can be decreased with enhanced blood glucose control, and the change of lipid and blood pressure indexes and the avoidance cigarette smoking and overabundance alcohol utilization are now suggested for the avoidance of different complications of diabetes . • Sectioning of the volar carpal ligament of carpal tunnel syndrome. Diabetic neuropathy is a distressing condition which requires tight blood sugar control, besides early recognition and appropriate management measures. It should be addressed in multidisciplinary approach. Sensorimotor and cardiovascular neuropathies are common in diabetic patients. Aside from strict glycaemic control, no further remedial methodology exists in the prevention of this phenomenon. The reasons that just a few patients with nerve lesions develop neuropathic torment are still obscure. Risk factors, for example, age, sexual orientation, pain intensity before and after the lesion, and emotional and cognitive features indicate that there are multiple factors other than the nerve lesion itself that contribute to the manifestation of chronic pain. Saurabh P Kakade and Khushboo Thakkar. Inter-disciplinary Approach Ought to Periodontitis and Type 1 Diabetes Mellitus in India. J Diabetes Metab 5:385. Luisa M Rodriguez et al. The Relationship between Self-Management and Glycemic Control in A Cohort of Children with Type 1 and Type 2 Diabetes. J Diabetes Metab 4:319. Grazia Tosone et al. Diabetes Mellitus Type 1, Latent Autoimmune Diabetes of Adults and Hepatitis C Virus: What we Know and what we Need to Know. J Diabetes Metab 4:301. Chapman MJ et al. Macrovascular Disease in the Elderly with Type 1 Diabetes. J Diabetes Metab 2013; 4:299. Subhashree Venugopal. Biochemical Alterations in Diabetic Neuropathy. J Mol Genet Med 8:147. Krista Garrod et al. Prevention of Ulceration and Amputation, by Neurolysis of Peripheral Nerves in Diabetics with Neuropathy and Nerve Compression: Decisiontree Utility Analysis. J Diabetes Metab 2014; 5: 330. Raffaella Mormile. Insulin Micro-secretionin Patients with Long Duration Type 1 Diabetes: Implications of Interferon-γ? J Diabetes Metab 2014; 5:367. Fiorino P and Evangelista FS. Complications of Type 1 Diabetes Mellitus are Associated with Renin Angiotensin System: The Role of Physical Exercise as Therapeutic Tool. Pancreat Disord Ther 2014; 4:133. Barthelow Classen J. Review of Vaccine Induced Immune Overload and the Resulting Epidemics of Type 1 Diabetes and Metabolic Syndrome, Emphasis on Explaining the Recent Accelerations in the Risk of Prediabetes and other Immune Mediated Diseases. J Mol Genet Med 2014; S1:025. Sousa MG et al. Death Receptor in the First Year after Simultaneous Pancreas/Kidney Transplantation. J Nephrol Ther 4:150. Barrera JR. Insulin Resistance among Adults with Type 1 Diabetes Mellitus at the Philippine General Hospital. J Diabetes Metab 2013; 4:315. Ballanyi K et al. Nerve Growth Factor Signaling Pathways Modulate HIV Vpr’sactions on Sensory Neurons: A Potential Target for Treatment of Distal Sensory Polyneuropathy in HIV/AIDS. J AIDS Clin Res 2014; 5:334. Anna Hristova. Neurological complications to botulinum toxin: A therapy. J Bacteriol Parasitol 2013; 4:4. Daniela AP et al. Markers of Parkinson’s Disease Progression Using Cerebrovascular, Autonomic and Small Fiber Polyneuropathy Features. J Neurol Disord 2015; 3:217. Grisold W et al. Leukemia and the Peripheral Nervous System: A review. J Leuk (Los Angel) (Los Angel) 2014; 2:162. Kun Xu et al. Diabetic Peripheral Neuropathy Triggers Herpes Simplex Keratitis Recurrence: A Novel Molecular Mechanism Study and Hypothesis. Cell Mol Biol 2014; 60: 102. Lima L M et al. Novel Partial Agonist of PPAR-Gamma for Treatment of Diabetic Neuropathy in Rats. J Diabetes Metab 2014; 5:392. Shah VN et al. Endothelial Nitric Oxide Synthase Gene Polymorphism and the Risk of Diabetic Neuropathy in Asian Indian Patients with Type 2 Diabetes. J Diabetes Metab 2013; 4: 243. Deguchi T et al. Antiplatelet Therapy, Diabetic Neuropathy and Peripheral Vascular Disease: A Unitary Approach. J Diabetes Metab 2012. S5:005. Yoo M et al. Painful Diabetic Peripheral Neuropathy: Presentations, Mechanisms, and Exercise Therapy. J Diabetes Metab 2013; S10: 005. Yuan H et al. Evaluating the Usefulness of the Diabetic Peripheral Neuropathy Screening Process. J Diabetes Metab 2012; S5:007. Vigneri S. The Brain-Gut Axis: From Pathophysiology to Possible Future Strategies of Treatment. Brain Disord Ther 2014; 3:137. Racosta JM and Kremenchutzky M. The Role of Autonomic Dysregulation from Pathophysiology to Therapeutics of Multiple Sclerosis: A Putative Novel Treatment Target? J Neurol Neurophysiol 2014; 5:212. Okada Y and Okada M. Komatsuna Seed Extracts Protection Against Amyloid β(1-42)-Induced Neuronal Cell Death. J Diabetes Metab 5:368. Ahmad H et al. Antioxidation and Antiglycation Properties of Bunium Bulbocastanum Fruits Various Fractions and its Possible Role in Reducing Diabetes Complication and Ageing. Vitam Miner 2014; 3:118. Perera PRD et al. Antiglycation and Antioxidant Activities of a Ready to Serve Herbal Drink of Syzygium Cumini Bark Extract. Med Aromat Plants 3:148. Perera PRD et al. In Vitro Antiglycation Activity of Some Medicinal Plants Used in Diabetes Mellitus. Med Aromat Plants 2013; 2:143. Falcone C et al. Soluble Receptor for Advanced Glycation End-products Levels in Chronic Heart Failure and Its Correlation to Left Ventricular Ejection Function. J Clin Exp Cardiolog 2013; 4:275. Toyosaki T et al. Effects of Medium-Chain Triacylglycerols (MCT) On the Maillard Reaction. J Food Process Technol 2013; 4:224. Yan Lu. Ganglion cell loss is the Major hispathological changes on APP/PS1 transgenic mice. J Clinic Experiment Ophthalmol 2012; 3:2. Williamson JR and Ido Y. Linking Diabetic Complications to Sorbitol Oxidation, Oxidative Stress and Metabolic Suppression. J Diabetes Metab 2012; 3:219. Jahromi M et al. Critical Association Study of Olfactory Receptor Gene Polymorphism in Diabetic Complications. Immunome Res 10:079. El Asrar MA et al. Serum and Urinary Nitrites and Nitrates and Doppler Sonography in Detection of Early Diabetic Complications. J Diabetes Metab 2:117. Blaslov K et al. Highly Elevated Tyrosine Phosphatase Antibodies in a Type 1 Diabetic Patient with Advanced Diabetic Complications and Exocrine Pancreatic Dysfunction. Microinflammation 1:106. Ezquer M et al. Mesenchymal Stem Cell Therapy in Type 1 Diabetes Mellitus and Its Main Complications: From Experimental Findings to Clinical Practice. J Stem Cell Res Ther 2014; 4:227. Matuleviciene V et al. A Retrospective Study in 5,989 Patients with Type 1 Diabetes in 10 Outpatient Diabetes Clinics in Sweden of the Frequency of Measuring HbA1c in Clinical Practice. J Diabetes Metab 2014; 5:377. Srivastava P et al. The Effect of Glycemic Status on the Serum Amino Acid Profile of Diabetic Saudi Patients. J Drug Metab Toxicol 2013; 4:157. Jaiswal N et al. Inhibition of Alpha-Glucosidase by Acacia nilotica Prevents Hyperglycemia along with Improvement of Diabetic Complications via Aldose Reductase Inhibition. J Diabetes Metab 2012; S6:004. Ewing GW. The Framework of a Mathematical Model of the Autonomic Nervous System and Physiological Systems: Using the Neuroregulation of Blood Glucose as an Example. J Comput Sci Syst Biol 2015; 8:059-073. Noa RB and Michal Kl. The Association between Cardiac Autonomic Control System and Motor Performance among Patients Post Stroke: Review of the Literature. Int J Neurorehabilitation 2014; 1:136. Kawsar Sardar. Stress response to surgery under general anesthesia in type 2 diabetic patient. Surgery Curr Res 2014, 4:6. Messina G et al. Orexin System Modulates Resting Energy Expenditure, Autonomic Nervous System and Cardiovascular Disease in Menopause. J Anesth Clin Res 2014; 5:472. Sakuragi S. Effects of Foot-Massage on Mood and Autonomic Nervous System and the Interaction with Personality. Int J Sch Cog Psychol 2014; 1:112.
van der Kruijs SJM et al. Autonomic Nervous System Functioning Associated with Epileptic Seizures: Analysis of Heart Rate Variability. J Neurol Neurophysiol 5:215. Patural H et al. Autonomic Nervous System: A Biomarker of Neurodevelopmental Comportment- the AuBE Study. J Clin Trials 2014; 4:176. Lu DY et al. The Pathogenesis and Treatments of Diabetes, A New Insight. Adv Tech Biol Med 2014; 2:e102. Kim N et al. A Potential Role of Autoantibodies against Muscarinic Type 3 Receptor in Pathogenesis of Sjogren's Syndrome. J Clin Cell Immunol 2014; 5:275. Lu DY et al. The Pathogenesis and Treatments of Diabetes, Questions and Answers. Cell Dev Biol 3:e126. Kaur N et al. 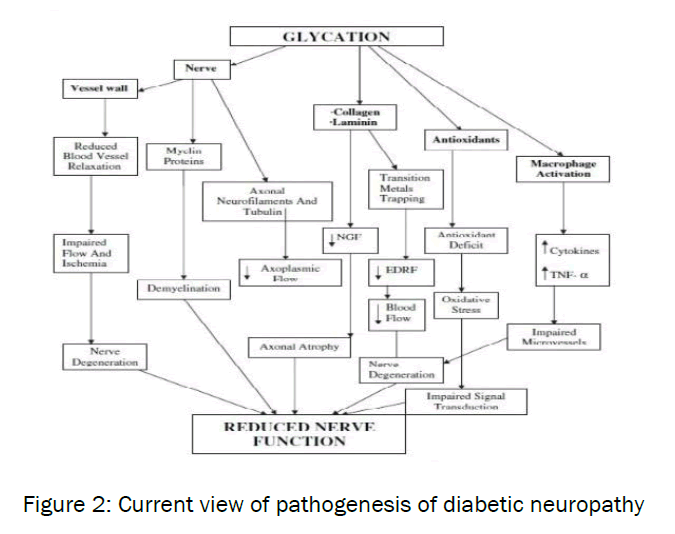 Diabetic Autonomic Neuropathy: Pathogenesis to Pharmacological Management. J Diabetes Metab 2014; 5:402. Singh HR. Advantage technology-precision measurement of ECG parameters- A milestone in online medical diagnosis for quality healthcare delivery. J Clin Exp Cardiolog 2015; 6:4. Weledji EP and Fokam P. The Diabetic Foot. J Nurs Care 2015; 4:234. Medvedeva EV et al. The action of neuroprotective peptide semax on the expression of genes affecting the activity of immune system in rat brain focal ischemia. J Mol Genet Med 2014; 8:3. Heltianu C and Guja C. Role of Nitric Oxide Synthase Family in Diabetic Neuropathy. J Diabetes Metab 2011; S5:002. Hassan M et al. Ubiquitin Proteasome System as Target for Tumor Therapy. Chemo Open Access 2014; 4: 142. Ria R et al. Multiple Myeloma: The Role of Angiogenesis in Disease Progression. J Bone Marrow Res 1:117. Gebreyes AA. Hypocupremia associated cytopenia and myelopathy: A Scotland national retrospective review. J Blood Disord Transfus 2013; 4:5. Namaka M. Treatment management of neuropathic pain. J Neurol Neurophysiol 2012; 3:2. Illgner U and Wetz HH. Infections of Charcot Feet: Diagnostics and Treatment. Clin Res Foot Ankle 2014; S3:008. Sumpio BJ et al. Use of Negative Pressure Wound Therapy in Healing Below Knee Amputation in Patients with Chronic Venous Insufficiency and/or Charcot Disease. Angiol 2013; 1:112. Witzke KA and Vinik AI. Charcot Neuroarthropathy may be the RAGE. J Diabetes Metab 2012; S1:005. Esteghamati A et al. Biphasic Insulin Aspart 30 (BIAsp 30) is Safe and Improves Glycaemic Control in Insulin Naïve Patients with Type 2 Diabetes. J Diabetes Metab 2011; 2:123. Ghosh GC. Bimelic Symmetric Hirayama’s Disease: Outgrowing its ‘Brachial Monomelic Amyotrophy’ Origins. General Med 2014; 2:143. Tiwari N et al. Therapeutic Targets for Diabetes Mellitus: An Update. Clin Pharmacol Biopharm 2014; 3:117. Namekata T et al. Association of Prediabetes and Diabetes Mellitus with Cardiovascular Disease Risk Factors among Japanese Urban Workers and their Families: A Cross- Sectional Study. Epidemiol 2014; 4:157. Sanchez Hernandez OE et al. EZSCAN as a Screening Tool for Prediabetes and Diabetes in a Large Mexican Population. J Diabetes Metab 2015; 6: 50. Shenoy N. Impaired Glucose Tolerance and its Association to Oral Cancer. Oral Hyg Health 2014; 2: 151. Yan S et al. Morbidity of Diabetes Mellitus in Cynomolgus Monkeys. Biochem Pharmacol (Los Angel) 2015; 4: 163. Uddin Z and MacDermid JC. A Knowledge Translation Perspective on the Two Quantitative Sensory Tests and their Usability with Clinicians. J Nov Physiother 2015; 5:257. Ciliacus E et al. Multifocal Acquired Demyelinating Sensory and Motor Neuropathy in Pregnancy, a Case Report. J Clin Cell Immunol 2013; 4: 175. Ozlece HK et al. A Case of Systemic Lupus Erythematosus with Peripheral Neuropathy Misdiagnosed as Brucellosis. J Neuroinfect Dis 5:142. Kovačević S et al. Motor Ocular Neuropathy Caused by Mefloquine. General Med 2015; 3: 150. Sharma B. Peroneal Muscular Atrophy with Pyramidal Signs: Where do we Stand? Introduction. Int J Neurorehabilitation 2014; 1: 108. Florence Suma P et al. Sensory, Physical and Nutritional Qualities of Cookies Prepared from Pearl Millet (Pennisetum Typhoideum. J Food Process Technol 2014; 5: 377. Ross S et al. Pressures of Injection in a Cadaver Model of Peripheral Nerve Blockade. J Anesth Clin Res 2014; 5:445. Cavaletti G and Marmiroli P. An "Old" Approach to the Damage of the Peripheral Nervous System: Do we Still Need Morphology? J Cytol Histol 2012; 3:e105. Petyaev IM and Bashmakov YK. Diabetic Neuropathy: Emerging Victory of Antioxidants. J Diabetes Metab 2012; S5:e001. Cruickshank JM. The Unholy Alliance between Obesity, Type-2 Diabetes, the Sympathetic Nervous System, and Hypertension in Young/Middle-Aged Subjects. 2014; J Mol Genet Med S1:016.